Visit Paradise. Visit Isla Contadora. We have the coolest rental cars on the island - all electric. Playa Executiva. Have it all to yourself. 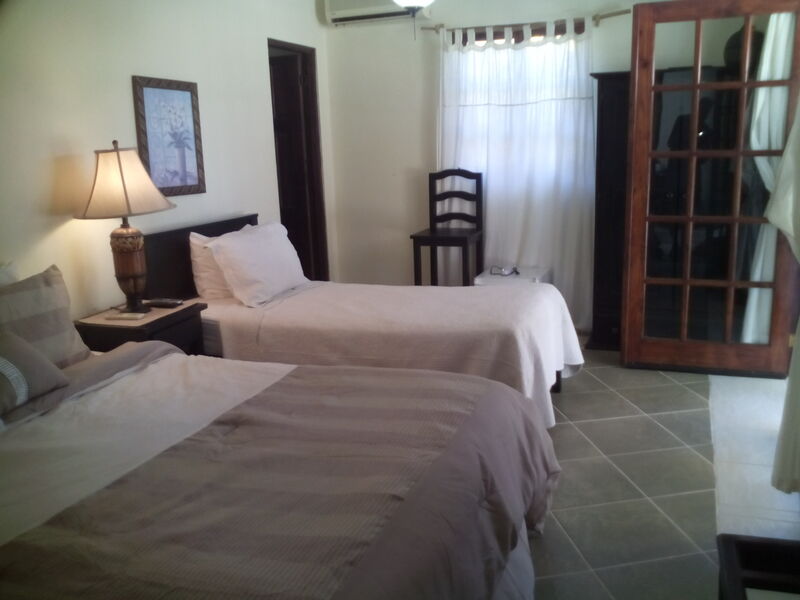 We are waiting to welcome you with the most comfortable beds and coolest rental cars on the island! Whale watching season runs from July thru October. Four of our five rooms have their own terrace. The journey is as great as the destination. Playa Larga with beautiful water and lots of natural shade. Come by air or come by sea. It's worth the trip. A perfect place to do some deep sea fishing. A drive through the rainforest on some of the best roads in Panama. The sloth who lives in front of Hibiscus House. 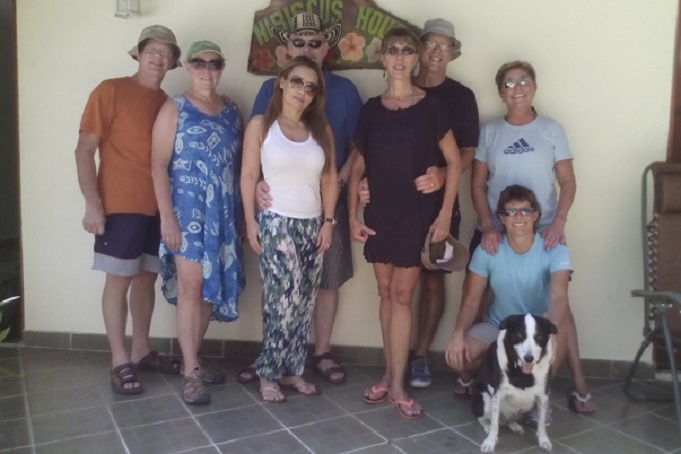 Happy guests and smiling dogs at Hibiscus House. For reservations email allanb@breadner.com or call (507) 6781-1638 or click the button to check availability and book online. Our Bed and Breakfast has four different and equally comfortable room options. 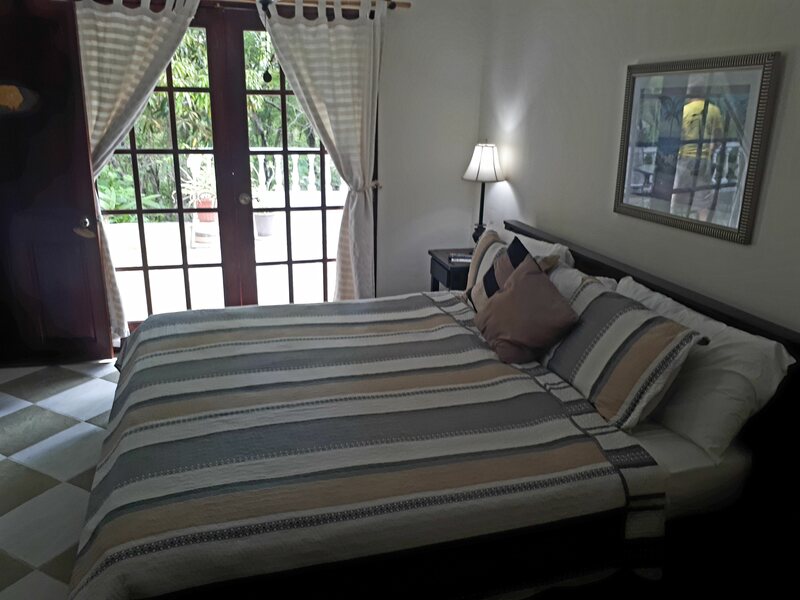 We have three rooms with a king size bed, two of which have a private ensuite washroom. We have one triple room with one queen bed and one single bed and ensuite washroom, and finally one room with one queen bed that shares a washroom with one of the king rooms. The two rooms sharing a washroom form a suite which is ideal for families with children. 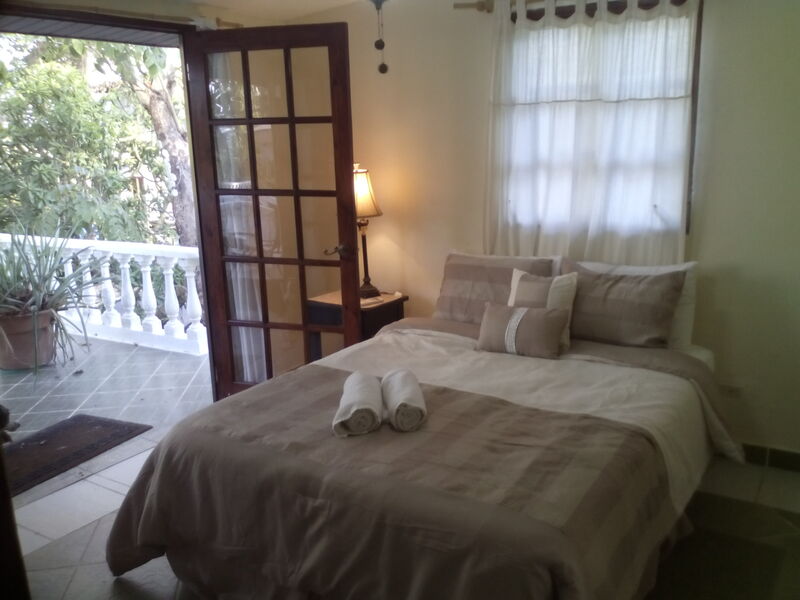 All rooms are independently air-conditioned, have flat screen TVs and satellite service, and all accomodations include daily maid service plus our delicious and hearty breakfast. Perfect for couples with lots of room to relax after a hard day at the beach. Two of the three king rooms have french doors which open to the large terrace at the back of the house overlooking the rainforest. A good choice for a small family or two singles travelling together. This room has one queen and one single bed, a private washroom and french doors opening to the front terrace. You might be lucky enough to catch a view of our resident sloth in the trees directly in front of this room! Ideal for a couple or when rented in conjuction with the adjoining king room it works well for a family with children and affords privacy for everyone. This room has a shared washroom and french doors opening to the front terrace. Hibiscus House is a delightful 5 bedroom/4 bathroom Bed and Breakfast recently opened on the gorgeous island of Contadora, in the Pearl Island Archipelago, Panama. 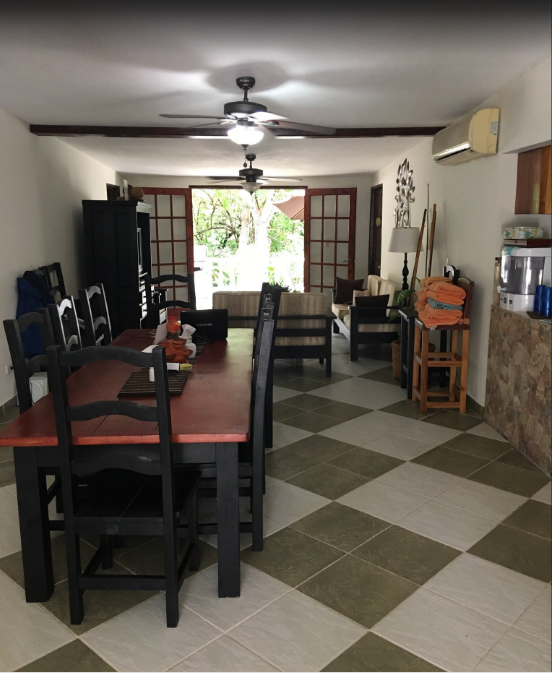 The House is located in a peaceful residential area, just a few minutes walk to nearby white sand beaches, and calm bays of turquoise water filled with tropical fish. The front and back decks of the house showcase a native tropical wooded area with luscious palm trees, indigenous flowers, and an abundance of wildlife including hummingbirds, green parrots, pelicans, magnificent frigata, sloths, deer and agouti. Contadora is an amazing place to enjoy your tropical vacation and Hibiscus House is the perfect place to stay while on the island. The Sea Las Perlas Ferry makes the 90 minute trip daily from the Amador Causeway to Contadora with their fleet of spacious and stable Catermarans. Check their website www.ferrypearlislands.com for schedules, rates, online reservations and additional information, or call them at 507 391-1424. The Air Panama makes the 15 minute trip daily from the Albrook airport to Contadora. Check their website www.airpanama.com for schedules, rates, online reservations and additional information, or call them at (507) 316-9000. Beach Combing. Walk on the beaches where several Survivor television series have been filmed. 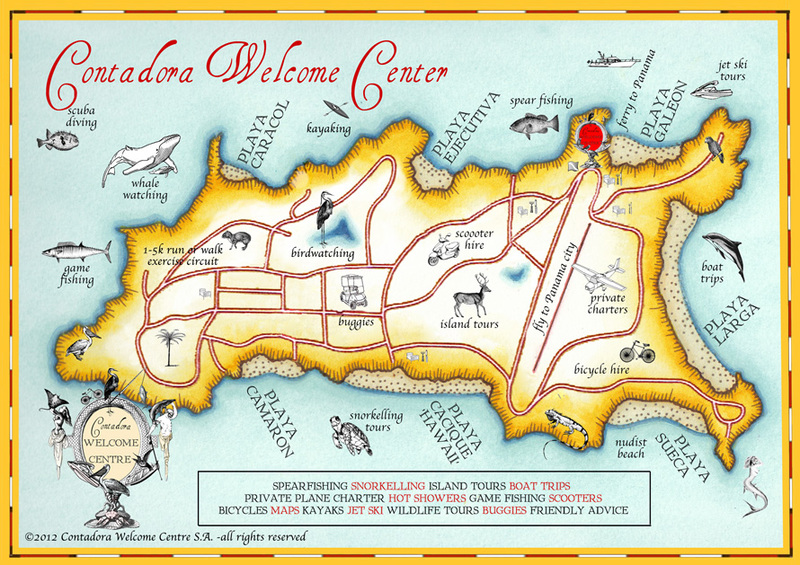 Snorkeling from the Beach and we are happy to point out the best spots. Bird Watching. Bring your bird watching binoculars to get close up views of the many different birds including the Blue-footed Booby. © 2016 Hibiscus Group. All Rights Reserved.